One of the benefits of working at Quilt Cove is the twice yearly staff retreats. Our owner, Sue, runs a beautiful retreat home in New Prague, Minnesota, called "The Getaway" that can accommodate up to 20. It overlooks Cedar Lake. 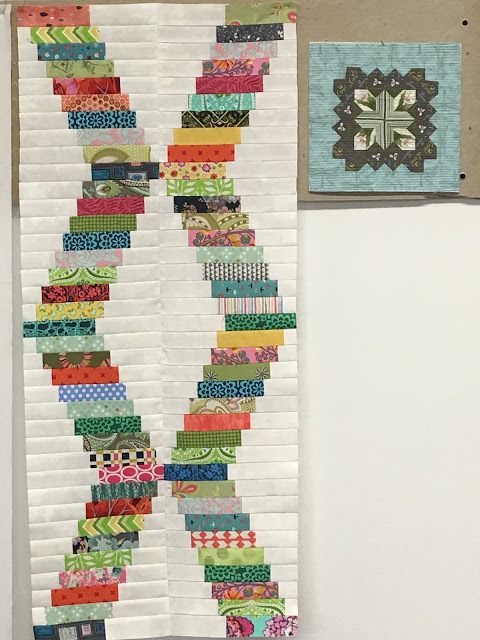 Here are 3 of Sandi's projects. On the left is a fabric covered balloon! She got that pattern from Calico Hutch Quilt Shop in Hayward, MN. 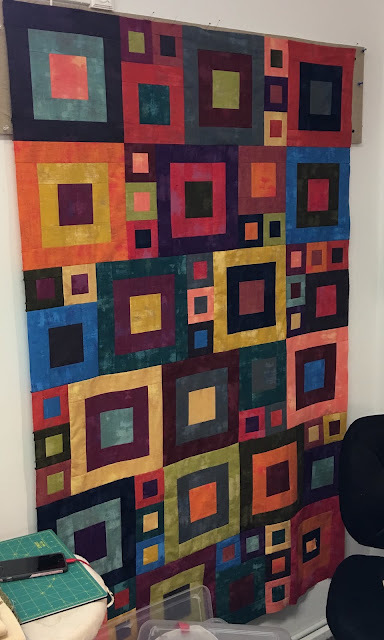 She quilted the middle piece. 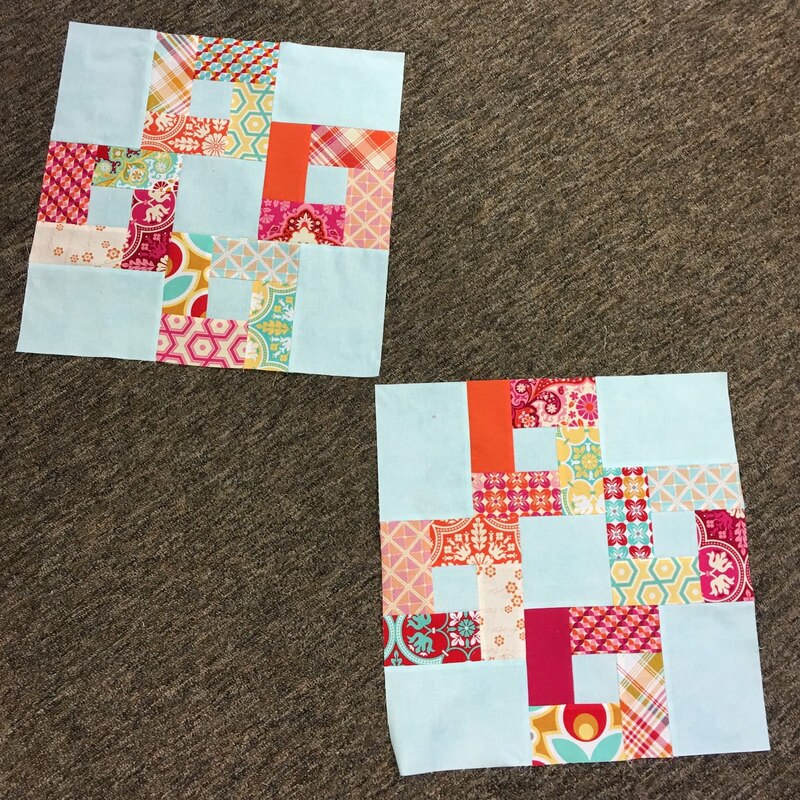 And she made some blocks for the "Getting To Know Hue" BOM from Quilt Cove. She was just starting this fun, modern quilt. It's a Turning Twenty pattern called "Hope Chest Treasures". And she was working on this flannel quilt for a Christmas gift. 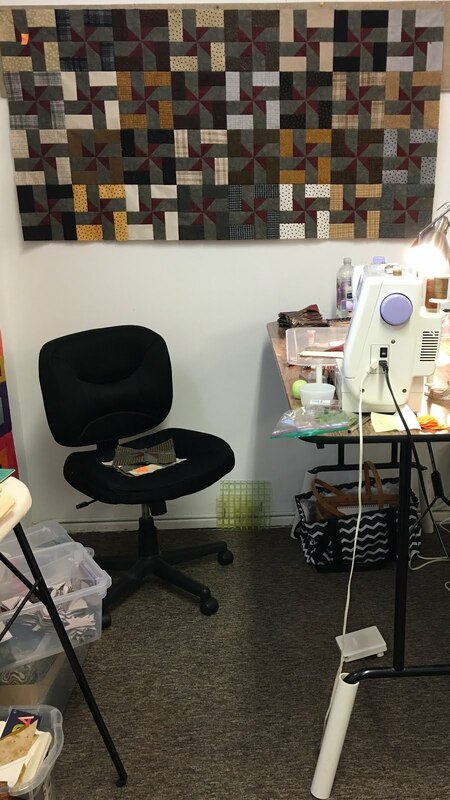 She had the brilliant idea to put her table up on PVC pipes and stand and sew! I tried it and it worked great! 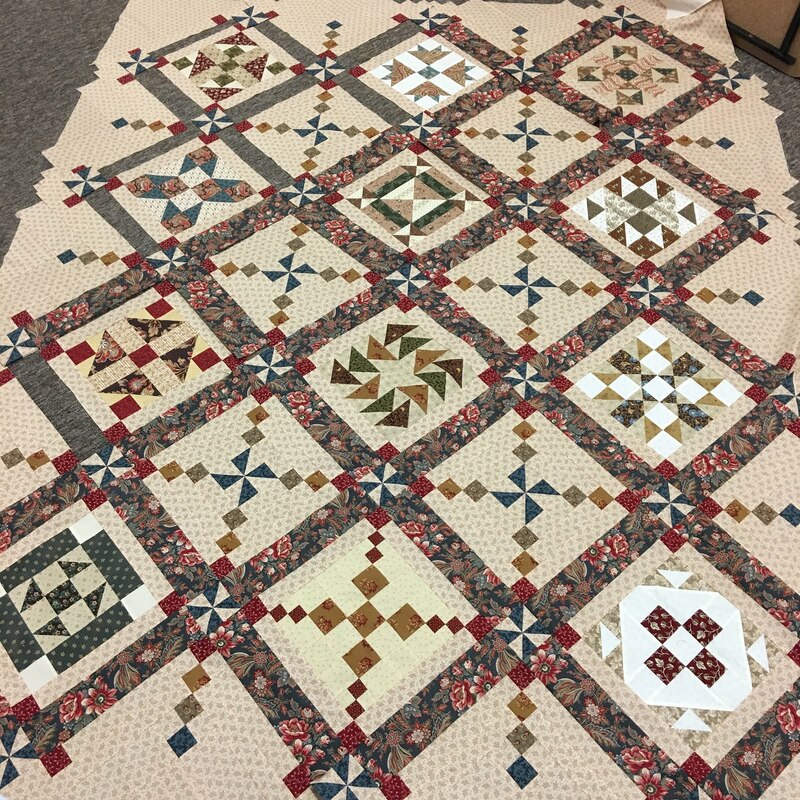 Barb was courageously tackling the final steps of this BOM--sewing together blocks, sashing and borders. Looking great!!! 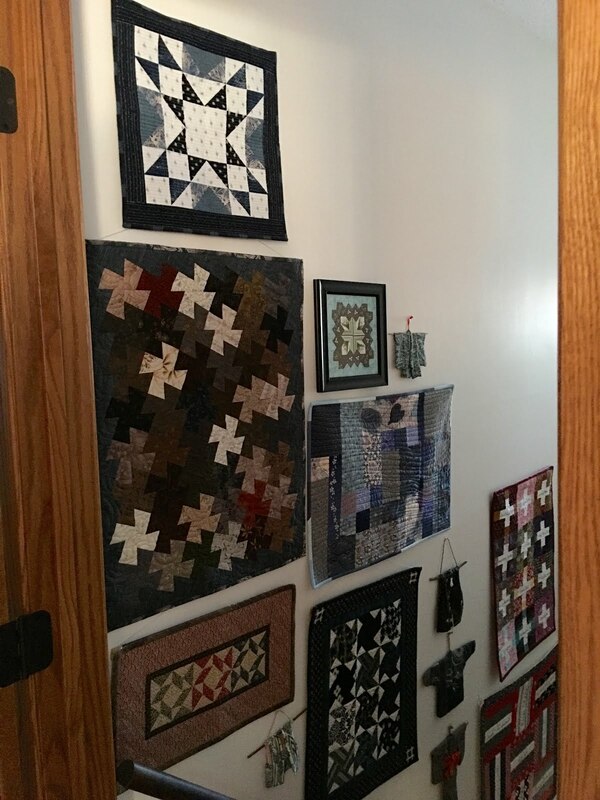 She's done the same quilt in batiks. 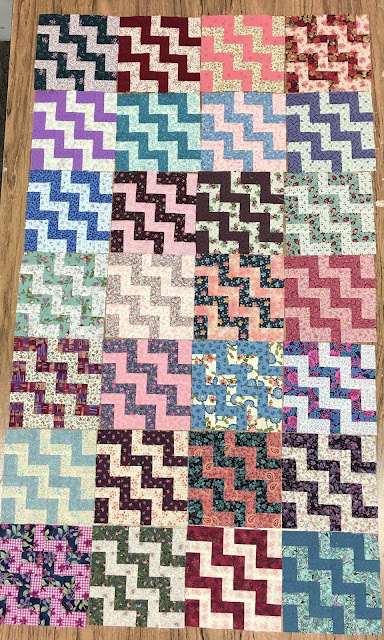 My first project was to finish sewing together this quilt top, which will be a Christmas gift. 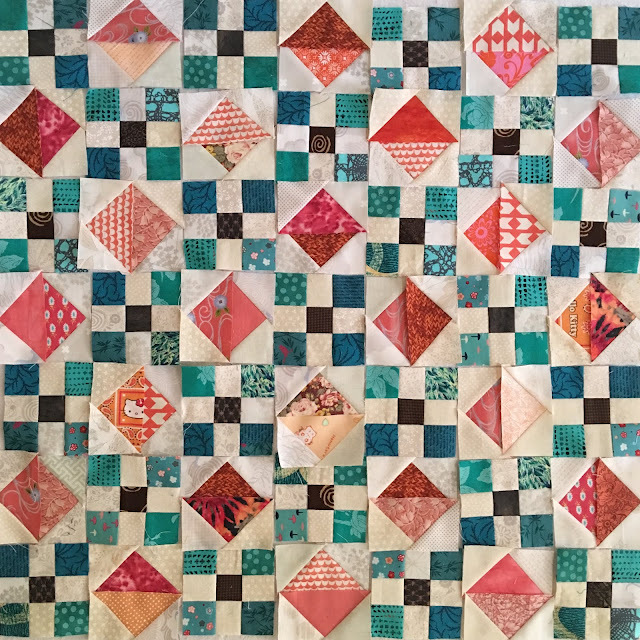 The pattern is "Follow the Leader", from the book Fat Quarter Love by the Modern Quilt Studio. The fabrics are Dr. Who purchased from Massdrop, alternated with Japanese cotton kimono fabrics purchased at a kimono shop in Mitaka, Japan. My next project was to finish piecing this "Go With the Flow" tablerunner. 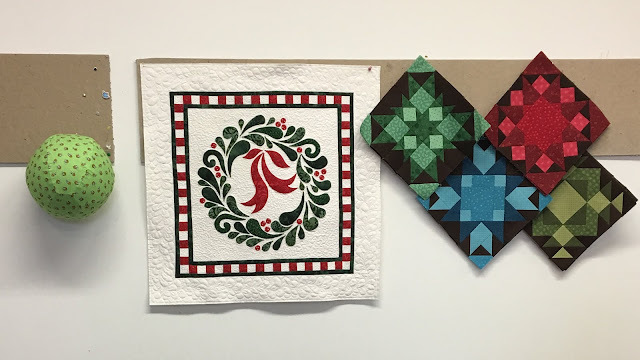 The pattern is from Longarm Quilting Workbook, by Teresa Silva. You can see the first one I made as a gift here. Back home I put it in this frame from Hobby Lobby. One has to really hunt to find a square picture frame! 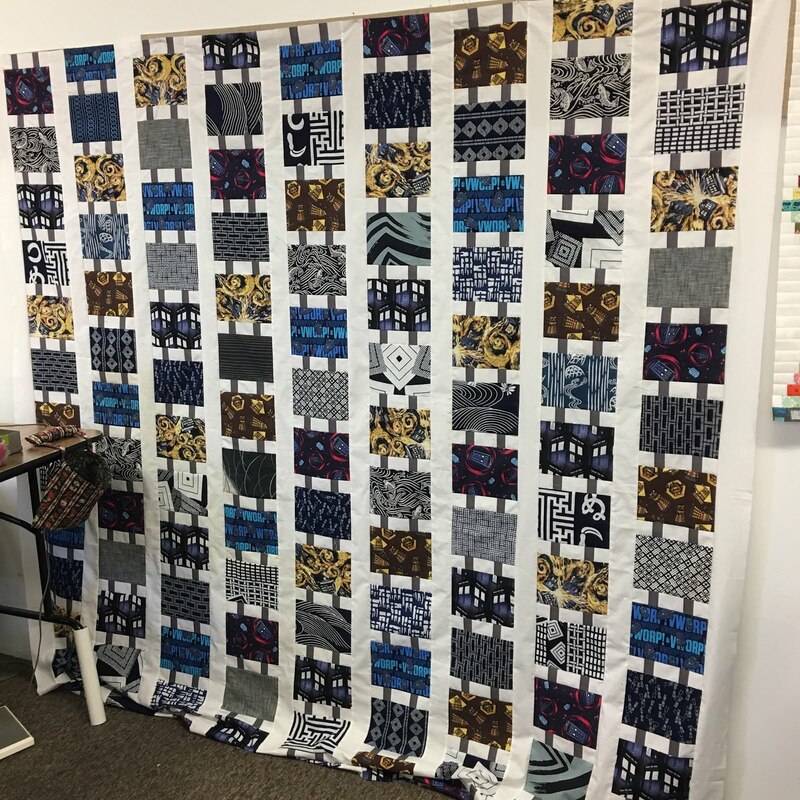 My last project was to finish step 2 of Bonnie Hunter's "On Ringo Lake" mystery quilt. 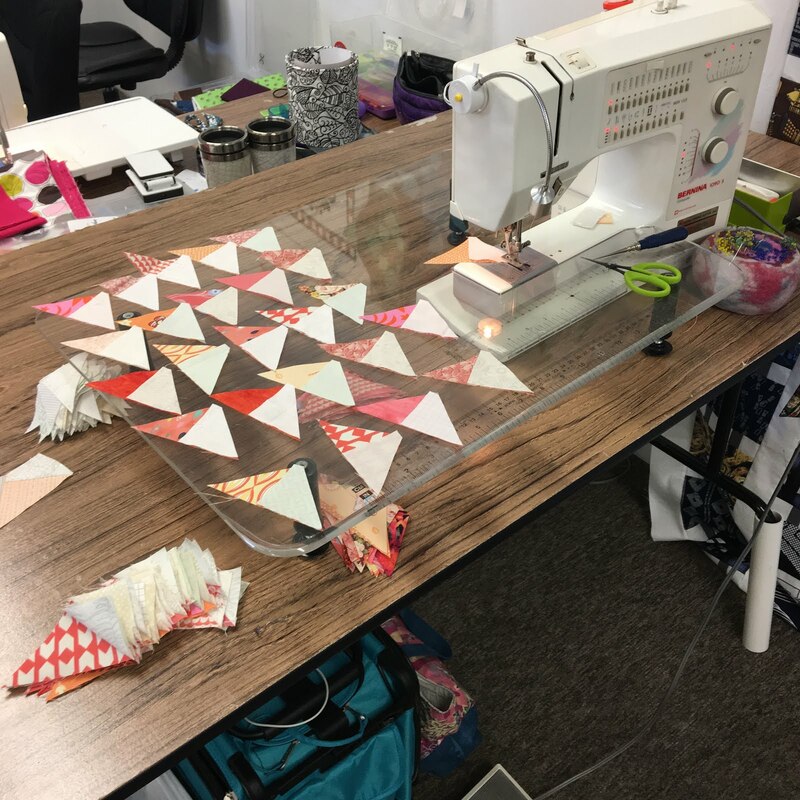 Step 1--nine-patches and step 2--flying geese. Step 3 is cut out. There were more employees and more projects. These are the projects I got photos of. If you're interested in using The Getaway just call Quilt Cove! 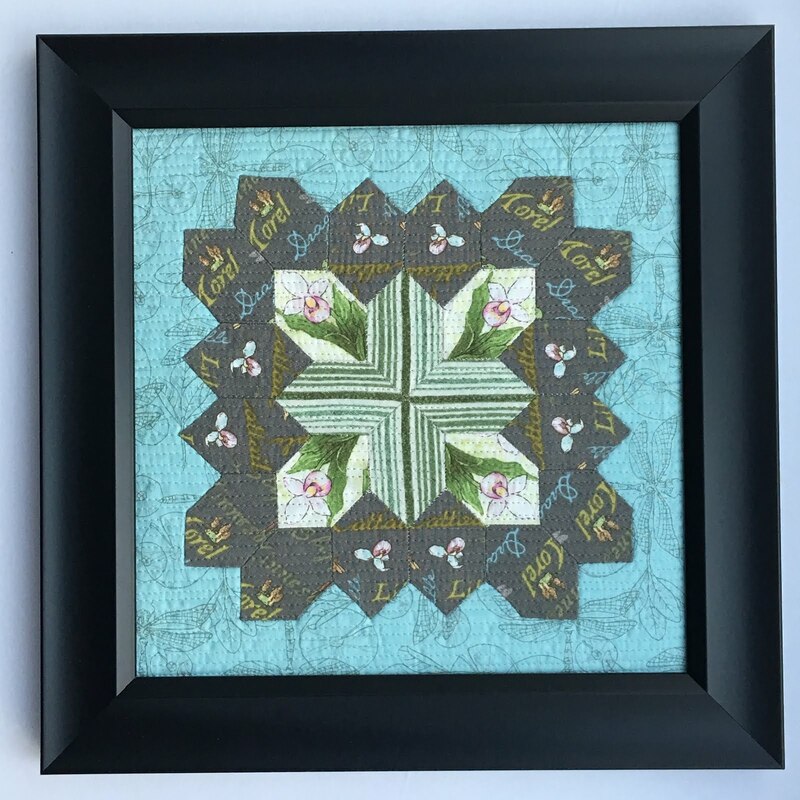 Wow, what a great virtual quilt show! I was excited to see "Quilt Cove"! I lived in Apple Valley from 2008-11 and loved trips to Quilt Cove! I bought the fabric for my very first quilt there so remember the place fondly. I'm back in Michigan now., but thanks for the flashback. Wow!! Really great projects at Retreat!!! Thanks for sharing. 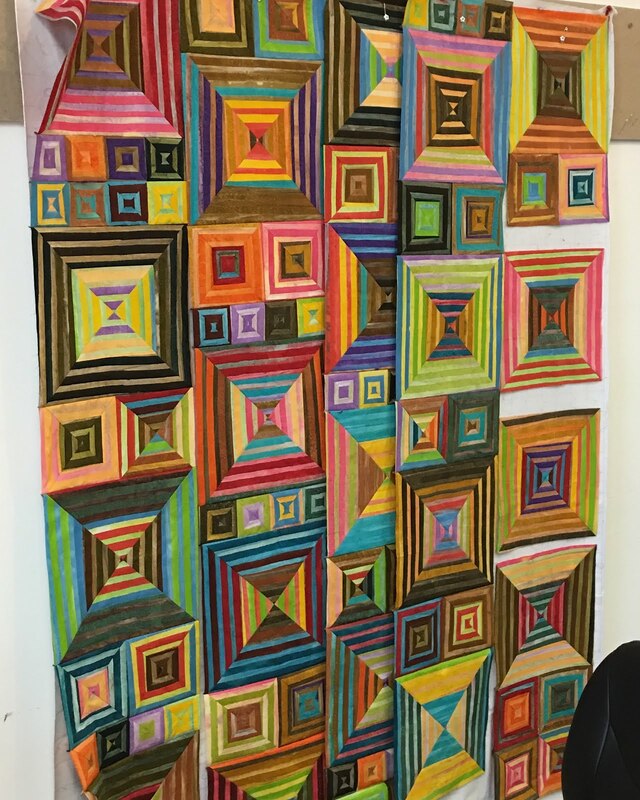 Wow, amazing quilts and progress! So fun to have this tour of your quilt retreat. It really puts my quilting to shame. What amazing talent you all have, thanks for providing the eye candy to go with my coffee this morning! Happy Holidays. Wow what a productive retreat! So many fun quilts. Your Follow the Leader quilt is so cool! Thanks for sharing -- I hadn't heard about The Getaway. Will have to keep that in mind. Such great projects; looks like you all were very productive! I love the combination of Dr. Who fabrics and Japanese kimono fabrics! Lots of really fun projects here! My favorite is that striped fabric one; I'd love to make a quilt like that! Such terrific projects! So many interesting designs and patterns. Wow, it looks like the retreat was a lot of fun and very productive! What a productive weekend - for everyone! There's just nothing like getting away and getting things done! This was a wonderful post to read and look at! I am partial to Kyle's Batik squares. What a treat to get to do these retreats! Love your stairwell gallery and your Ringo lake patches. What a fun, diverse set of projects! But that last one! I do like the look of the On Ringo Lake bits and the color scheme for this year. I think this will be a spectacular quilt. I can’t wait to see the final design. Your stairwell is a lovely gallery! I felt like a fly on the wall after reading this wonderful post. My problem when I go on a retreat is I'm not very productive since I tend to be distracted with what everyone else is doing. I would have had the same problem if I were on this retreat. I absolutely love your quilt with the Asian and Dr. Who fabric--I think I may already have the pattern. Thanks for sharing. Have a wonderful Christmas! A working retreat! What fun. But what usually happens to me is I end up talking and not sewing. Beautiful projects!